This L shaped office desk from Bestar would function well as a computer desk in your home office. It has an executive desk design with all the drawer space and storage you need. The white chocolate and antigua option offers a more modern look. This unit works well in a corner, when space is at a premium. Backed by a five year manufacturer limited warranty. Order today and get free shipping! 1” commercial grade work surfaces that resist scratches, stains and burns. File drawer on ball-bearing slides for a letter or legal filling system, a utility drawer and plenty of storage in its hutch. This reversible design is a ready-to-assemble collection and is backed by a 5-year manufacturer’s limited warranty. 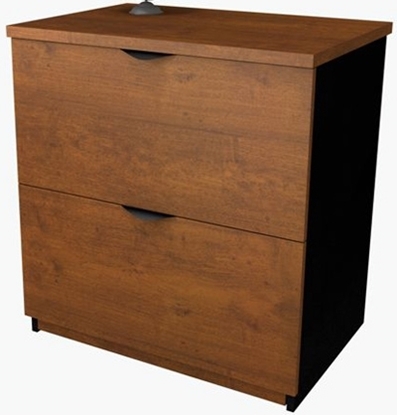 Part of the popular Bestar Innova series, this lateral file cabinet offers a distinctive 1" top. Durable and functional, it accommodates letter or legal size folders. Matches other Bestar office furniture collections. Innova bookcase by Bestar adapts to your storage needs with its five shelves as three of which are adjustable. A anchoring system is furnished for greater stability.